Italy and Greece are steeped in history with a treasure trove of ancient sites and scenic beauty. On this affordable Italy & Greece tour, you’ll see the fantastic features these countries have to offer, starting in Rome and ending in Athens. In Italy, you’ll stay in Rome, and the Florence and Venice areas; in Greece, you’ll stay in Olympia, Nauplia, and Athens. You’ll also spend one night on a ferry-crossing of the Adriatic Sea from Ancona, Italy to Patras, Greece.Visit Rome with a local guide who brings ancient Imperial Rome back to life as you pass the Colosseum. Enjoy must-see sights, including Piazza Signoria, in the center of Florence; Juliet’s balcony in the medieval town of Verona; and Pisa’s famous Leaning Tower. In Venice, take a boat ride to St. Mark’s Square for some relaxation and people-watching. While in Venice, you’ll have the opportunity to watch glassblowers create works of art as they have done for centuries. Step back in time on your visit to Athens’ Acropolis and the Parthenon, dating back to the 5th century BC and the most accurate indication of the influence and wealth of Athens at its greatest peak. Also visit Mycenae, dating back to 1350 to 1200 BC, where you’ll marvel at the arches, fountains, ramparts, and amazing masonry still standing. All of these elements come together perfectly to create a value-minded Italy and Greece tour like no other! 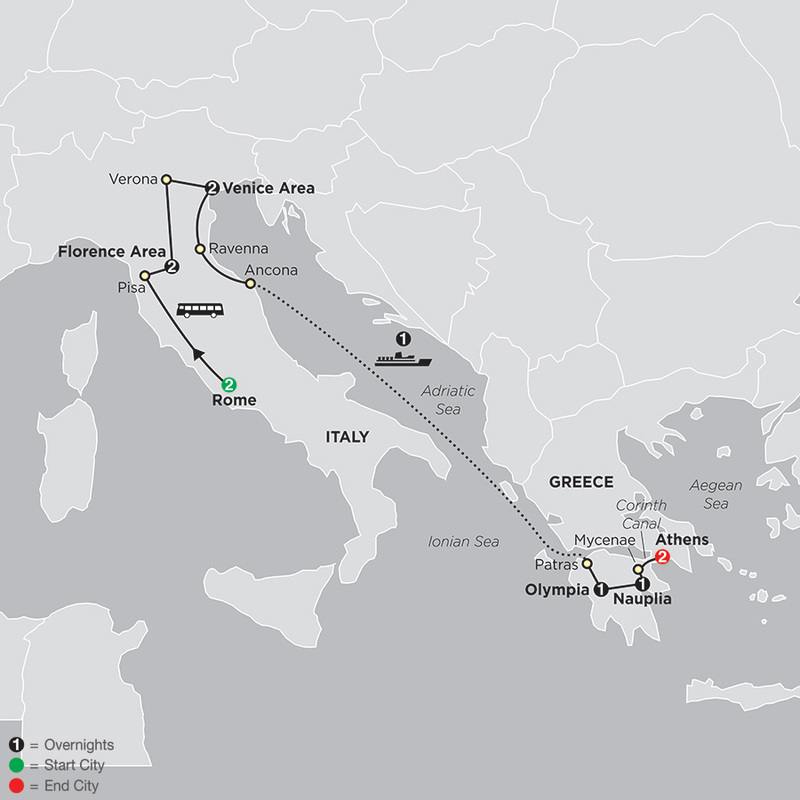 Day 7: VENICE AREA–ANCONA (EMBARKATION)–OVERNIGHT FERRY CROSSING TO PATRAS, GREECE.